UK Armed Forces Commentary: A new golden era for naval guns? A new golden era for naval guns? Modern, miniaturized guidance technology is making possible to turn cannon shells into high-accuracy effectors, with a great range and a cost much inferior to that of missiles. Missiles have never entirely replaced the naval gun because of their cost, and because they have significant difficulties in effectively engage targets at very short range. In addition, you can’t really fire warning shots with missiles. On the other hand, naval gunfire support was seen as a dying specialty until not so long ago. It was indeed the experience in Libya, with several thousand rounds expended against targets ashore, that really revived interest for naval guns. It is fair to say that we are very possibly entering a new golden age for naval gunnery, thanks to the long-range, precision guided ammunition which is about to attain full technical maturity and enter service in the first few navies. It is a revolution in which Italy, though Oto Melara, has a big say. And it is a revolution that involves the Royal Navy, which plans to buy a new medium caliber gun system (including guided, long range ammunition), rolling it in service as part of the Type 26 Global Combat Ship package. The Oto Melara 127/64 “Lightweight” gun and the BAE Systems / United Defense MK45 Mod 4 127/62 are the two contenders for the contract, which would likely expand, later on, to include a retrofit to the Type 45 destroyers as well, to enable the RN to keep its medium caliber gun logistics focused on one single type, as the old MK8 bows out of service. Oto Melara is a key player in the new naval gunfire revolution as it produces those that, as of now, are the most innovative and advanced products in the sector: the 127/64 gun, the lighter 76/62 Strales, and the related guided ammunition, VULCANO and DART. 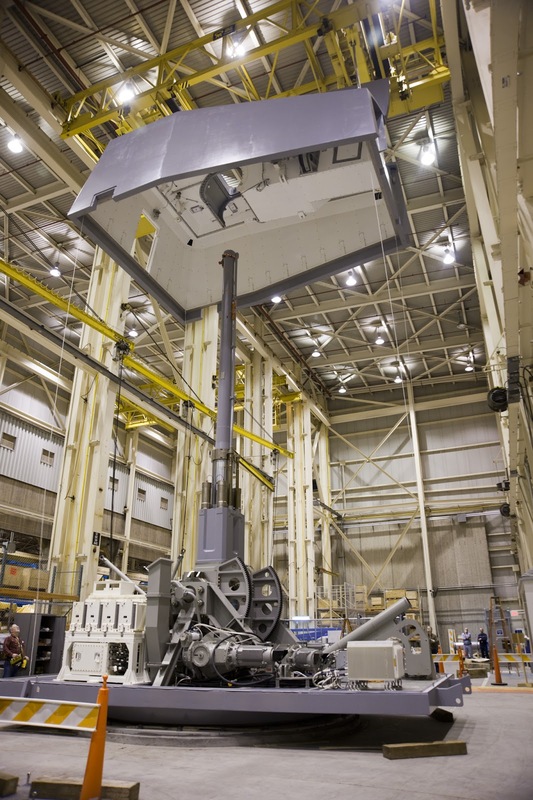 BAE systems replies with the ambitious 155mm Long Range Land Attack Projectile (LRLAP), developed specifically for the Advanced Gun System (AGS) mounted on the sole three ships of the DDG1000 Zumwalt class of the US Navy. More significantly, BAE systems has been recently working to validate a more exportable product which, like Italy’s VULCANO, is compatible with normal 127mm naval guns and 155mm land howitzers: this new ammunition is the Standard Guided Projectile (SGP) and it meant to fill the capability left by the cancellation of the ERGM (Extended Range Guided Munition) program. The 127/64 Lightweight is the most modern medium caliber gun in the world. It is being installed on the Italian FREMM General Purpose frigates and it has also been ordered by Germany for installation on the new F125 frigates. The Lightweight is also being jointly offered by Oto Melara and Babcock for installation on the british Type 26 frigate. 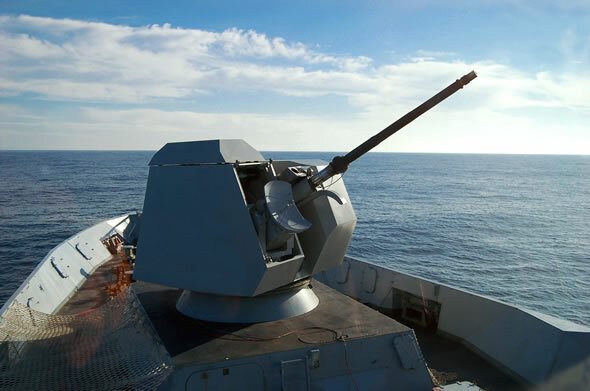 The Lightweight gun system is in production since 2010 and has been first installed on the Italian FREMM-class frigate Carlo Bergamini. More than a simple medium caliber gun, the LW is a system which comprises the gun tower itself, the Automated Ammunition Handling System (AAHS), the VULCANO ammunition family and the Naval Fire Control System. The 127/64 is the latest evolution of the older 127/54 COMPATTO gun which Oto Melara sold to several countries all around the world (Italy, Japan, South Korea, Argentina, Peru, Niger, Venezuela). The extent of the evolution is such, however, that it is fair to say that the Lightweight is more or less an entirely new system. The 127/64 gun employs a 64 calibers barrel made of high-resistance steel alloys. It has a water cooling system and a pepperpot muzzle brake, while the stealth shield of the turret is realized in aluminum, lighter and cheaper than the Glass Reinforced Plastic used in previous models. The gun tower comprises a modular automatic feeding magazine with four rotating drums, each holding 14 ready-to-fire rounds, for a total of 56 shells. The drums can be reloaded while the mount is in operation, allowing for the sustainment of extremely long bombardments. The drums can be manually reloaded by personnel lifting the rounds in position, or they can be refilled automatically by the highly mechanized AAHS magazine system. The auto-loader is equipped with a system that automatically recognizes each variant of the shells in the drums, allowing the quick selection, in any moment, of any kind of ammunition available. The ammunition flow is also reversible, so each round can be unloaded and exchanged right up until immediately before the firing. 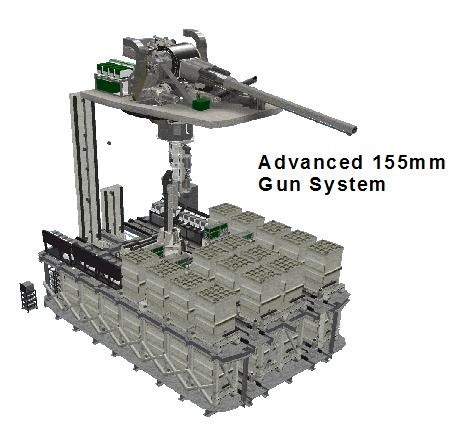 The AAHS mechanized, automated ammunition depot is a wholly modular system which can extend over two or three decks into the ship. It is equipped with special “moles” which can take the rounds out of the storage boxes and bring them into the feeding drums of the gun mount. Again, the ammunition flow is reversible, so the rounds can also be brought all the way back, with little to no direct human intervention. On the FREMM frigates of the Italian navy, the AAHS is installed over two decks (deck 2 and deck 3) and can hold 350 rounds in addition to the 56 held in the feeding drums. Images from the firing trials of the 127/64 of the FREMM frigate Carlo Bergamini. The first image shows the excellent capability of engagement at very short range, which can seriously ruin the day for suicide boats and similar threats. The revolution, though, comes with the VULCANO family of long range projectiles. 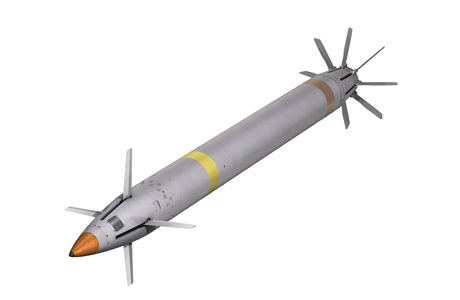 The VULCANO, differently from LRLAP, ERGM and SGP is not a rocket-propelled munition, but an under-calibre, rocket-shaped dart with a diameter of 90 mm. VULCANO employs a discarding sabot to be fired out of the barrel at extremely high speed while avoiding two of the main complexities of full-calibre rocket-propelled rounds: increased barrel wear and tear, and difficult deployment of the folding fins used for guidance. These problems, along with huge cost escalation, were the factors which killed the ERGM. The GPS/INS/SAL round variant was originally to be developed only for use from land 155mm howitzers, but when Germany entered into the VULCANO program, they pushed to develop it for the 127mm naval guns as well. The industrial agreement giving the go ahead to this development was signed in the summer 2012 during Eurosatory. Oto Melara supplies the projectile, while Germany’s Diehl supplies the miniaturized, shock-resistant Semi-Active Laser seeker. The VULCANO is, effectively, a tri-national program which sees Italy, Netherlands and Germany co-funding the development. The IIR seeker is instead meant primarily for anti-ship role. This variant of the round is in fact produced only for the 127mm naval guns. Targeting enemy ships on the open sea is a complex job, and it might be very hard, if not flat-out impossible, to have a third party observer marking the target with a laser. The anti-ship VULCANO is meant to be fired over the area where an enemy ship is known to be sailing, and engage the target on its own. The ammunition is thus programmed to enter a descending trajectory already a few miles before entering the target area, allowing the built-in IIR seeker to scan the surface of the sea to detect and track the heat signature of the enemy vessel. Once the target is located, the maneuvering round will pursue it, using its canards and fins to steer to compensate for the enemy’s evasive maneuvers. Much cheaper than an anti-ship missile, the VULCANO IIR is much less deadly, taken singularly, since its warhead is much, much smaller. However, a dart as small and fast as a VULCANO is considerably harder to detect, track and engage with hard-kill defences such as CIWS guns and missiles. Besides, a big number of guided shells can be fired in very short time against the same target, saturating its defences and inflicting deadly damage with multiple hits. VULCANO rounds employ a microwave fuze called 4AP (4 Action Plus) which offers detonation on impact, proximity, time or airburst, with the possibility to program before the launch the height over the ground at which the round will explode to pelt the target with pre-fragmented slivers. The advanced fuze, the high accuracy and the modern pre-fragmented warhead compensate for the much smaller payload carried by the sabot-discarding dart, ensuring an adequate lethality. The GPS/INS and GPS/INS/SAL will fly 120 km if fired by a 127/64, reducing to around 100 km when fired from the shorter barrels of the 127/54 and of the 155/52 howitzers employed on land. The anti-ship ammunition has shorter legs, since it begins to descend from its ballistic trajectory much earlier than the other variants, to enable the IIR seeker to find the target. A warship will be engaged at around 70 to 80 km. The BER ammunition is readily adoptable on any NATO-standard 127mm naval gun or 155 mm howitzer. It does not require any modification. The guided variants of Vulcano, instead, require the addition of the so called “V-Kit”, the system which programs the information on the location of the target into the guided rounds before they are fired. The modification, anyway, is minimal: the V-Kit can be quickly installed on board the ship without requiring any docking period. This means that it is possible to turn, with minimum expenditure of money and time, older 127mm guns into VULCANO-capable weapons. It is what the Italian Navy is doing, modernizing the old 127/54 COMPATTO mounts installed on the frigate Bersagliere and on the destroyers Luigi Durand De La Penne and Francesco Mimbelli. The Italian navy has chosen a rather important modernization, however, as it is also introducing on these ships variants of the modular AAHS mechanized ammunition depot. Obviously, this modification, much more challenging, does require a period of refit. The Netherlands plan to adopt the same approach, modernizing the 127/54 COMPATTO mounts on the four frigates of the De Zeven Provincien class and also installing the AAHS magazine. Oto Melara is actively offering this kind of modernization to all navies which employ the COMPATTO. 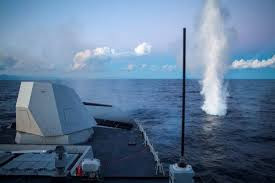 Germany, as earlier said, has ordered five 127/64 gun systems, four of which will arm the four F125 frigates, while the fifth will be used on land, for training purposes, and has already been delivered and installed in the school of naval engineering in Parrow. Two more 127/64 will be delivered to Algeria in 2014 and 2015 to arm the two new MEKO 200 frigates being built by Thyssen Krupp. 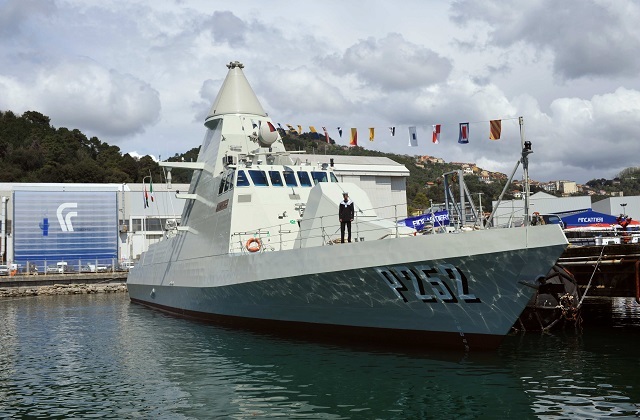 Italy has ordered two 127/64 mounts, the first of which has been installed on the brand-new, first of the FREMM-class frigate Carlo Bergamini. The second mount is due for delivery in 2015, to be installed on the sixth FREMM ship. The 127/64 gun, in fact, is the main cannon for the FREMM General Purpose variant, which also embarks an Oto Melara 76/62 for self-defence. The ASW variant of the FREMM is instead armed with two 76/62 guns. 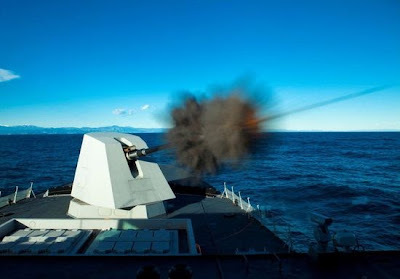 The Italian navy will take delivery of four more 127/64 gun systems if the order for the final four FREMM survives the budget cuts. The Navy is confident that all 10 the FREMM frigates will be built, but it has been suggested that, were the last four ships to be cancelled, the ASW frigates would disembark the 76/62 gun in A position and take the 127/64 instead. France currently employs a shrinking number of ancient 100 mm naval guns for naval gunfire support, while the new FREMM vessels are armed with the Oto Melara 76/62. The experience in Libya has re-awakened the French interest for a more capable naval guns, and the 127/64 has the eye of the DGA, however the tight budget is preventing the launch of any acquisition program, at least for the moment. The land variant of the VULCANO is due to be employed by the PZH2000 howitzers of the Italian and German armies, and the Netherlands, which employ the same gun, also have expressed their interest. One future development in the VULCANO family is the SCOUT round. This new projectile is in Research & Development phase. It is meant to be fired first at the beginning of a bombardment, to collect meteorological and atmospheric data along the whole trajectory to the target. The weather and atmospheric conditions are decisive factors to consider during long range artillery engagements, and with the VULCANO hitting targets at more than 100 km away, collecting such data in a complete, reliable way is key to obtain the maximum accuracy from the very first shot. Meteorological balloons are extensively used to collect the relevant data before the guns open fire, but the balloons only collect data in the firing point area, and the conditions can be radically different over a 100 km distance. The SCOUT projectile would conduct measurements along all the ballistic trajectory, self-destructing in flight at a distance from the target not to alarm it. The data collected will be sent back to the gun mount, which, is anticipated, will be modified to include a couple of antennas mounted in the shield, on the two sides of the barrel. The SCOUT projectile in flight and the naval gunfire control system would actively dialogue thanks to these antennas, and the computer could so introduce a whole range of corrections to the firing trajectory, dramatically improving the accuracy from the very first live round fired. This, in itself, is a crucial aspect in enabling commanders to trust the gun as a genuine precision strike weapon capable to surgically destroy targets even in built-up areas, with no collateral damage caused. The current status of the VULCANO sees the development of the BER variant completed. The first lots of BER rounds are in production for both the Italian navy and army, and the live fire trials of validation and the entry in service should both be achieved within the year. The guided variants, more complex, are completing their development phase. In the last few weeks, the GPS/INS/SAL ammunition was successfully employed in live firing tests from a PZH2000 howitzer, in South Africa. This follows a series of earlier tests in the ranges at Meppen, in Germany, where both the 155 and the 127 mm variants of the round had been fired but, due to the constraints of the relatively small range, the maximum distance covered had been 20 km, and the canards and fins on the rounds had been blocked. Essentially, the tests in Germany used projectiles made incapable to manoeuvre, and only demonstrated that the SAL seeker saw the target and acquired it as planned. Further firing trials will follow, including with the 127mm variant, but the priority has been accorded to tests from the PZH2000 since the German Army urgently needs to know if Vulcano works: it has an important requirement for a guided artillery shell, and the ministry of defence was oriented towards an Off the Shelf acquisition of the proven Raytheon EXCALIBUR shell. However, the EXCALIBUR does not offer the accuracy and range of the VULCANO, and it is also non readily compatible with the PZH2000’s autoloader: a problem that the VULCANO does not have. The conclusion of the test firings will enable the german army to order with confidence the European system, abandoning the EXCALIBUR path. The guided variants of VULCANO should enter production next year as the development and trials conclude. UPDATE: demonstration firings from PZH2000 concluded in June 2014 with good results. In July 2014 the German ministry of defence decided to go ahead with a joint qualification campaign for the VULCANO system. The qualification activities will take place in 2015, with first VULCANO 127 and 155 deliveries to Germany and Italy to follow in 2016. The british army might be keeping an eye on the matter, since it has a very similar requirement for a guided artillery shell, to be fired by the AS90, with an In Service Date planned for 2018. So far, the british army has trialed the EXCALIBUR, and in 2010 a firing demo with a slightly modified AS90 proved that compatibility issues had been ironed out. The EXCALIBUR is a virtually ready to procure solution, for the british army, but by 2018 the VULCANO will be a mature system, in service by a few years, and it might possibly be selected by the Royal Navy as well, introducing the alluring prospect of joint purchases and logistical commonality, with the significant savings that this implies. The EXCALIBUR is a full-calibre shell, so it carries a much larger explosive payload, but it is less accurate (it is a GPS-only ammunition) and it only offers a range of around 40 km, from a 39 caliber barrel such as the AS90’s one. The VULCANO would give the Royal Artillery a much longer arm. On the Type 26, an Oto Melara solution including 127/64, VULCANO and AAHS would ensure a formidable firepower. The 127/64 can employ the whole range of NATO standard ammunition, it has relevant anti-air and anti-FIAC capability and, with VULCANO, represents a precision strike weapon with a very long arm. The rate of fire is also extraordinarily high. The gun now installed on the Carlo Bergamini was extensively trialed on land: the tests included a 150-shells bombardment in the ranges of Cottrau (near La Spezia, in Italy) during which the gun demonstrated a 30 rounds per minute rate of fire. With the AAHS installed, rates of up to 35 rounds per minutes are expected to be achievable. These rates of fire are, of course, relative to the standard and BER ammunition: the need to program the target data into the VULCANO guided ammunitions slows down the process somewhat, reducing the rate of fire to 25 rounds per minute. Still better than most. The other impressive product of Oto Melara is the 76/62 gun. The 76mm gun has been around for decades, and it has been purchased and employed by dozens of countries, especially considering that the US Mark 75 is, in itself, a variant of the Oto Melara product, built on license. The 76mm is, to this day, the only Oto Melara gun to have served in the Royal Navy, as it armed the five Peacock-class corvettes employed in Hong Kong until 1997. The 76mm gun is in use in 56 countries around the world. The enormous number of 76mm guns in service all over the world has prompted Oto Melara’s development of new, impressive capabilities for the type. If the original COMPATTO could fire an impressive 80 rounds per minute, the successive evolution, the SUPER RAPIDO, increased that value to 120 (reducing to 60 rounds per minute in a prolonged bombardment). And now, Oto Melara is using modern technology to turn the 76mm Super Rapido in an impressive, all-around weapon system. The 76mm serves on several major warships as a CIWS. This is particularly true on the Italian navy warships: the Cavour aircraft carrier is armed with two such guns, the Andrea Doria-class destroyers (“cousins” of the british Type 45s as they came out of the HORIZON british-franco-italian project) carries three such guns, and they also appear on the FREMM frigates. STRALES is a guidance kit, installed within the gun turret and comprising a radio frequency beam antenna which is normally hidden under a sliding panel in the gun shield, to the side of the barrel. The covering panel slides upwards to reveal the radio frequency antenna when it is time to employ the DART (Driven Ammunition Reduced Time of flight), a guided, sabot-discarding high speed round meant to shot down airplanes and missiles as well as take off FIACs and suicide boats. The DART is an hyper velocity munition capable to cover a 5 km distance in less than five seconds, with enough energy to perform up to 40 manoeuvers and course corrections. The projectile is composed by two parts: the forward half of the round is free to rotate and has two canard wings which are employed to control the flying course. The aft part contains a 2.5 kg warhead made lethal by the pre-fragmented load of tungsten cubes meant to tear incoming missiles apart. The fuze employed is the 3A PLUS, a programmable tri-mode device. The tail has six fixed wings and the backwards-looking radio receivers. These, in fact, look back to the antenna mounted in the gun shield, to keep inside the radio frequency beam as the as they are guided in Command Line of Sight against the incoming targets. The system can so engage with extremely high accuracy and greater lethality the incoming anti-ship missiles, hitting them at much greater ranges than those achievable with smaller, less advanced systems such as Phalanx. A good image of the STRALES gun, with the antenna deployed and ready to guide DART rounds against their target. The 76mm gun, however, is also used on many naval units as the main gun of the platform, and not just as a CIWS. The Horizon-class destroyers of the Italian and French navies, the French FREMM frigates and the Italian FREMM ASW frigates are the most impressive examples of warships which do not have another, larger gun to employ. Countless smaller naval units all over the world have a 76mm gun as main weapon. To enhance the usefulness of this light gun, Oto Melara is working to develop the VULCANO 76mm, scaling down the bigger rounds. The development is progressing quickly, and it seems that there will be a GPS/INS 76 and even a GPS/IIR 76, while the Semi Active Laser variant is not planned, at least for now. In the 76mm variant, the VULCANO GPS/INS round has a range of 40 km, almost twice as much as the range of the much larger MK8 Mod 1 in service in the Royal Navy, to give an idea. In the anti-ship role, for the reasons already explained, the range is somewhat shorter. The development of the VULCANO 76mm has only been started in 2011, but the work is progressing very quickly thanks to the experience made on the larger rounds. Firing trials could begin already next year, and by 2015 Oto Melara believes that it will be able to start producing the new weapon. Both the DAVIDE/STRALES and the VULCANO capabilities can be installed relatively easily on existing guns. The STRALES kit has completed development and is beginning to appear on serving warships: the Italian aircraft carrier Cavour has been the first to have its guns modernized, and the two Italian Horizon destroyers are following. The VULCANO capability will also be easily retrofitted on existing gun mounts. The most impressive feature, however, is the possibility to employ both STRALES and VULCANO, from the same gun mount, giving the small 76/62 a formidable mission flexibility. Oto Melara is working on the gun-loading system of the SUPER RAPIDO to make it capable to employ a huge variety of rounds. This mechanical improvement is known as Multi Feeding Ammo Selection Kit, and it builds on the existing loader system. The 76/62 gun employs a drum holding 9 ready to fire rounds. The drum is constantly refilled by two mechanical “arms” coming from the two sides, each of which holds 38 shells, for a total of 85 rounds “ready to fire”. Currently, the two arms are unidirectional: they only bring the shells into the drum. In this way, each arm of the loading system can hold one different type of ammunition, enabling the gun to select one of two types of ammunition, for each shot. The Multi Feeding Ammo Selection Kit intervenes on the loading arms, upgrading them to make them capable to move in the two directions. In this way, thanks to an upgrade to the computers, it is possible to select and load the round number X, in the Y position along any of the two loading arms, meaning that rounds of all types can be available simultaneously. Thanks to the Multi Feeding system, it is possible to modernize a SUPER RAPIDO or COMPATTO mount, with minimum impact on weights, so that it can simultaneously employ standard ammunition, guided DART rounds when it is necessary to shot down incoming threats, and the whole variety of VULCANO rounds for shore bombardment and anti-ship attacks. This makes the 76/62 an incredibly versatile and effective weapon. A single mount of this kind gives to a ship, also very small in size, an incredible range of combat capabilities. The evolution of the 76/62 has caught the interest of the US Navy, which during 2012 conducted an extensive design review of the Littoral Combat Ships which noted that the Bofors MK110 light gun is not as effective as would be desirable. One of the most interesting options on the table is the possible future fitting of the 76/62, replacing the MK110. The 76/62 is a compact, light mount, which can be installed in small spaces and even high up on the superstructures. On the Italian FREMM frigates, for example, one 76/62 is mounted on top of the helicopters hangar. It would be very easy to fit the 76/62 on the Lockheed Martin/Marinette Marine monohull LCS, the FREEDOM sub-class. A bit more complex, but not impossible, would be the retrofit of the trimaran LCS of the INDEPENDENCE sub-class, built by General Dynamics/Austal. With the larger caliber, the longer range, and the availability of the multi feeding system, with DART and VULCANO ammunition, the 76/62 would represent a dramatic improvement in firepower for the LCS. In the UK, a 76/62 gun mount could be a fantastic equipment for the future 3000-tons MCM, Hydrographic Patrol Capability (MHPC) vessel. Although the first concepts suggested that such ships would only be very lightly armed (just a 30 mm gun turret, according to most), and although the Royal Navy is understandably hesitant in adding a whole new gun, with its ammunition and logistic needs, the range of capabilities offered by the 76mm gun is absolutely impressive, and on its own the gun would add a lot of survivability and fightability on the new hulls. Finally, it is worth to mention that the latest addition to the 76mm gun evolution tree is the Stealth gun shield, entirely made of carbon, with foldable gun barrel and sliding cover. This extremely stealth mount has been required by the UAE for the new FALAJ-class corvettes. 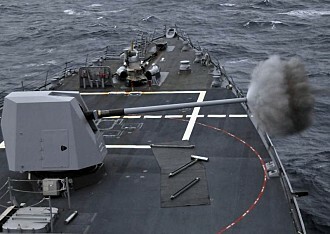 Such “vanishing guns” have first appeared in the US DDG1000 Zumwalt design. A FALAJ-class corvette shows the 76/62 mount installed and fully closed. The DDG1000 Zumwalt has arguably been designed around its two “super guns”, the 155mm Advanced Gun System (AGS). 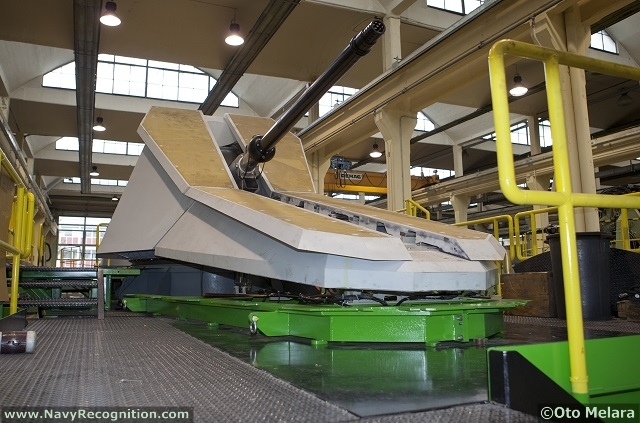 This new gun is meant to restore a powerful, long range naval gunfire support for US Marines operations, following the loss of the fearsome hitting power that, for decades, had come from the 406 mm guns of the modernized Iowa-class battleships. The 155/62 gun is primarily meant to fire the long range, guided LRLAP munition. The gun is wholly automatic, and the loading of the rounds completely mechanized. It couldn’t be different, as the LRLAP, once completed with its modular launch charge and rocket, is 2,2 meters long and weights an astonishing 104.3 kg. The barrel is water-cooled and folds inside the large, boxy stealth turret when not in use. The DDG1000 has two such gun mounts, in A and B positions. The AGS is a massive and expensive gun system. So far, it is not planned for any warship other than the 3 (down from an original planning assumption of 32!) DDG1000 Zumwalt super-destroyers, in themselves revolutionary but extremely expensive ships. The LRLAP guided long range munition is only employable by the AGS. Guidance is obtained by combination of GPS and an Inertial Measurement Unit for navigation. Differently from VULCANO, the LRLAP is a full calibre round, thus offering a much larger payload, meaning a heavier, more destructive warhead. The round is steered towards the target thanks to folding fins that deploy immediately after the shell leaves the barrel: recent tests have been successful, but it is fair remembering that faulty deployment of the folding winglets was one of the main problems that lead the ERGM program to its cancellation. Proper development of these fins is a complex engineering challenge, crucial for the success of the LRLAP. The LRLAP is capable to hit targets at a distance of 137 km, thanks to a large rocket booster which is activated by the pressure of the firing. The LRLAP is, differently from VULCANO, a multi-piece munition: the shell must be loaded together with the rocket booster and the modular launch charges for the firing. The use of modular launch charges make possible to employ the Multiple Rounds, Simultaneous Impact (MRSI) attack method, in which elevation and launch charge values are adjusted for each round fired, so that up to six shells will hit the target simultaneously (within 2 seconds), in volleys. On the other hand, the more complex and time consuming loading process reduces the rate of fire of the AGS to just 10 rounds per minute, which means that a DDG1000 Zumwalt, with two AGS mounts, can fire around 20 rounds in a minute, against as many as 25 VULCANO rounds fired from a single 127/64 gun. The LRLAP round, fins deployed. Much more relevant is the combination MK45 Mod 4 and SGP, which has great export potential outside of the US and which is the other contender in the race to equip the Type 26 frigate. UPDATE: as of December 2014, MK45 Mod 4 is thought to be the winner in the race to equip Type 26, but an official announcement has yet to appear. The MK45 Mod 4 is the latest evolution of the MK45 gun mount which for many years has been the US Navy standard. It presents a longer (62 calibers), more resistant barrel, strengthened mount and redesigned gun shield. It can employ all semifixed 127mm standard ammunition and it was designed to be able to employ two-piece extended range ammunition. Indeed, the Mod 4 upgrade was launched specifically to employ the ERGM projectile. The EX-171 ERGM was to be a full-calibre 127mm shell propelled with a rocket booster and with a special, high-energy propelling charge, meant to achieve a 41 to 60 nautical miles range. The projectile would have been guided by GPS coupled to an Inertial Navigation System. 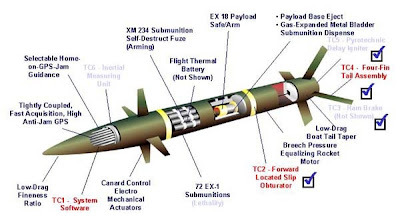 It was proposed for development with a load of 72 EX-1 sub-munitions (a variant of the M80 Dual Purpose Improved Conventional Munition DPICM) that would be released at an altitude of 300 meters over the target. The DPICM sub-munitions, also employed by the MLRS rockets, include a shaped charge and an enhanced fragmentation case, making them effective against vehicles, materiel and personnel. However, DPICM was prone to frequent failures: on average, 5% of the sub-munitions would not explode, and they would leave large areas unsafe and in need of clearance. Worries connected to this problem lead to a change to an unitary warhead which would deliver on a near vertical dive (+/- 10°) . ERGM was to be 61 inches long, and would be fired with a energy of 18 MJ against 10 MJ for a normal shell. This made the old MK45 guns incapable to employ it, and required the development of the sturdier Mod 4 mount, with its new barrel. These rocket-assisted munitions continue to wear down barrels faster than normal ammunition, in any case. In addition, these two piece ammunitions (shell + rocket), require a more complex and lengthy loading cicle, on two strokes, which effectively halves the rate of fire, from 20 to 10 rounds per minute. ERGM never managed to overcome its many problems, however, while unitary cost continued to escalate. In Fiscal Year 2008 the US Navy interrupted the over 12 years of work on the ERGM, effectively killing the program. This has left, until now, the MK45 Mod 4 incapable to employ a guided, long range munition. MK45 users, effectively, could only get that kind of capability by purchasing VULCANO from Oto Melara. To remedy, BAE Systems is now working on the Standard Guided Projectile - Multi Service, which can be considered a derivative of the LRLAP, downscaled. The SGP is a 127mm shell with GPS/INS guidance, propelled by a rocket booster and with an in-flight retargeting capability which enables the transmission to the projectile of updated GPS data for the target, making it possible to strike moving objectives.1.5 meters long and 50 kg heavy at launch, SGP is quite a large beast. BAE aims to achieve a CEP better than 10 meters for the new round, with a range of 96 - 100 km (52 to 54 nm) and a rate of fire of 10 rounds per minute when fired from a MK45 Mod 4. The CEP value increases with the distance covered by the shell: during a test earlier this year, at 36 kilometers the error was inferior to 2 meters. At maximum range, the CEP value will of course be greater. The SGP is a full-caliber 127mm round, thus offering a larger payload than the VULCANO. The SGP comes with a 16.3 kg HE warhead (unknown balance of explosive to fragmentation material, usually it is some more of the latter). The SGP is also offered for use on land, where it fits inside a sabot to be compatible with 155 mm howitzers. From a 155/39 howitzer (like the one fitted on AS90) the range is around 70 km, with a rate of fire of 3 rounds per minute. The 127/64 gun is the most capable and modern medium naval gun in the world, at the moment. It offers a superior rate of fire, of between 30 and 35 rounds per minute, against 20 for the MK45 Mod 4. It also has a longer barrel (64 calibers against 62), offering increased ballistic performance, also when employing standard ammunition. The naval VULCANO is a one-piece ammunition, sabot-discarding, without rocket booster. It is simpler, more reliable and less stressing on the barrel than rocket-propelled rounds. The price to pay is a significant reduction in payload, which means carrying a smaller warhead (Vulcano carries 2.5 kg of explosive, about the same as a 120 mm mortar round, plus an unknown but almost certainly similar weight of prefragmented tungsten material), less lethal. This can be a problem at times and a benefit in other occasions: a smaller warhead is more suited to high precision strikes where the risk of causing collateral damage is high. When destructive power is key, the VULCANO is at a disadvantage. However, being a single-piece, all-up round, it can be fired more than twice as fast as a rocket-propelled round: a 127/64 can fire up to 25 VULCANO rounds in the same time that a MK45 Mod 4 takes to fire 10 SGP shells. Magazines of the same sizes, in addition, will hold as many as twice the number of VULCANO rounds than SGPs, as the SGP is a 1.5 meter ammunition (shell and rocket), meaning that a ship equipped with VULCANO can compensate for the smaller warhead by firing more shells. This has a cost, of course, but it somewhat balances advantages and drawbacks. Finally, VULCANO is at a more advanced stage of development. It is overall more mature, and already comes in several different and very interesting variants. The SAL round, in particular, is likely to draw the attention of military planners. The IIR round is also promising, if less immediately interesting: engaging a warship with gun rounds instead of with missiles can be, in some cases, more effective. And in pretty much all cases, less expensive. The SGP promises to eventually come with a SAL seeker itself, and even a moving target capability, but this has yet to come into play, with VULCANO ahead, at the moment. What appears certain, is that the rapid development of such capable artillery rounds, offering range, lethality and accuracy, will open the doors for a new golden age for gunnery. Missiles haven’t won the day. The new Oto 127/54 is outstanding; the most interesting thing on the drawing board is BAE's AGS-Lite. totally agree that the royal navy needs to do something about its naval gunfire support but cant help thinking that all these conventional designs will be superseded by upcoming rail gun designs within the next decade or so. Well, the work BAE has been doing is very promising, and as of now, rail guns certainly do seem to be the future. However, it is likely that many more years will have to pass before a truly mature solution is available, which is ready to be embarked and used reliably out at sea. An interesting and very informative article, thank you. Taking the central premis, a new golden age of naval gunnery is about to dawn, does that mean that we could look forward to ships with multiple turrets again? Probably, more that one gun per turret is out of the question, given the autoload systems, but the idea of a cruiser with four guns and so capable of kicking out a total of 120 rounds a minute at targets 60 miles away has a certain appeal. For sure no modern surface combatant could stand up to that sort of punishment. I don't know if it will quite get that far. Of course, DDG1000 has 2x AGS and 2x 57mm Bofors. FREMM have 1x 127 and 1x 76, or 2x 76, and Horizon destroyers have 3 turrets with 76mm guns. A ship with multiple 127mm mounts might not quite be the way, but i expect much more extensive use of naval gunfire in the future, also as a precision strike weapon. And thus more investment in training and technology. Which is not bad considering that even the RN was, not long ago, one step away from practically demising naval gunfire support training...! Never mind gunfire support to ground troops, I was thinking of guns again becoming an anti-ship weapon. A range of 60nm compares, I think, favourably with a surface launch Harpoon type missile and the shells can't be foxed, decoyed or shot down. They are arguably harder to shot down, but they won't be totally immune to ship defences. And decoys are still a problem: the Vulcano anti-ship is, after all, guided by a IIR seeker, like some missiles. Decoys capable to disturb IIR seekers do exist, obviously. OK, then I give up. If the shells. even 120 of them a minute, can be foxed and decoyed and even shot down, what is the point of all the money? Might just as well stay with what we have, which for the RN ain't much. The advantage, as Gabriele pointed out, is that shells are always going to be a cheaper alternative to missiles. It makes sense to have a sliding scale of capabilities to fit the situation, sometimes a missile is overkill but then their are other times when conventional shells just won't cut it. What about Type 26 just having a 127mm and forgoing the ASuW missiles, instead packing more space for CAMM and future anti-submarine rockets/missiles? I think a balanced range of capabilities is always desirable, so a deep-strike missile load would still be needed, in my opinion. I have only recently become aware of the peacock class. Such a shame in hindsight that they were sold off, the 3 ships of the class, would have been ideal in supplementing perhaps the n atlantic patrol, a gibraltar guardship and perhaps one for piracy in the indian ocean, or even west africa where it is a growing problem. How i would love to have 2-3 commisioned now to supplement the fleet. In terms of the replacement for MHPC i think the use of the 76 gun would be logical, as would give the ships real punch, to act as force multipliers also when you consider these ships, whilst having aviation facilities i doubt whether they would routinely operate helicopters so would aliveate that weakness somewhat. It is indeed a shame that the Peacock class was sold off. They were still relatively young ships and it was a short-sighted decision, although in 1997 the RN had a lot more ships around and a lack of an urgent requirement to keep them in service so I can see how it must have seemed advantageous at the time. Given all the information contained in the above, Gaby, do you think that the British Army perhaps still has the intention of fitting a 52 caliber barrel to the AS90? Secondly, do you think the possibility of fitting a 155 mm gun to any Royal Naval vessel in the future has now passed completely? Why would you want to keep the AS90 in the first first place? Neither Germany, nor Italy or the Netherlands have a requirement to keep all their PzH2000 in active service. I'm afraid the AS90 will almost certainly continue to the end with the 39 calibers barrel, despite the superior ballistic performances that would have been possible had the upgrade gone ahead. In the late 2020s there should be some work on the AS90 replacement, eventually, and it's likely that we won't see much until the new system is to be defined. I think the AS90 will be given, you know, just enough money to carry on with dignity. Maybe minor upgrades, yes, but the change of barrel, probably no. As for the 155mm gun, well. Since the AGS Lite is not in the race for arming Type 26, i'd say that the 155mm train has passed and gone, yes. It is impossible to see the far flung future, obviously, but in the medium term i don't see how a 155mm gun could re-enter the frame. Is the AS-90 the weakest of all guns amongst NATO countries? Pretty much, save for the old M109s which i believe are still used by some countries. "Why would you want to keep the AS90 in the first first place?" Because it is very much a part of the plans for "Army 2020". Fair enough. I'm just tossing around ideas. The plan to reduce the number of AS90 by about 1/3 was, if I recall correctly no strategic decision based on capability, but one based on the available budget which translated into the SDSR 2010. The underlying business plan just goes till 2015 so I remain reluctant. Fiscal realities have a thing to create new possibilities. Times have just not become dire enough. So why not think the impossible beyond national borders? At least such an option would be more readily available than buying some M777 or getting a new development based on the FRES SV into service. But where would the fiscal advantage be in retiring the AS90, which is already in service, paid for, and with well established training, simulators, and logistics, to buy a whole new system? Even if the PZH2000 are sold at an advantageous price, it will still cost more than keep the AS90 up to its 2030 Out of Service Date. There are still 89 AS90 kept in service post-cuts, in three armored, self-propelled artilly regiments, one for each armoured infantry brigade. Sorry, Wolftrap, I had not realized you were suggesting possibly buying spare PzH2000s. I think Gabriele is right on the comparative costs, though. Sooner or later the AS90 has to be replaced. Not doing it today means the value of doing it in +10 years is considered higher which I interpret as expecting long-term savings or another benefit by deferring it. However, by that time the UK will likely have to pay for the entire artillery system including infrastructure and training on its own – it has to be replaced one way or the other. Risk in the development should increase as the know-how to build new artillery systems depreciates with fewer active cannon artillery programs remaining and fewer pieces being build. The current trend looks like EDA's vision of more pooling and sharing might gain some traction simply because defence budgets continue to shrink and national gold-rimmed solutions become ever more unaffordable. Enter a contemporary high capability and surplus artillery asset where I _assume_ a 33% increase in range translates to an equal increase in “capability”. Thus, in keeping the same level of capability as with 89 AS90 the number of artillery pieces could equally be reduced by _at least_ 33% as well. That means low acquisition costs, no R&D, less personnel to operate the artillery and its logistical tail, smaller required infrastructure, have MOTS training solutions, no costly qualification of ammunition for a new developed artillery system or the cost in preparing new firing tables. Further it is possible to divide qualification costs for new ammunition with three partner nations and share training and operational experience. The Dutch and the UK already have framework procurement programs for ammunition so there already is a foundation for further harmonizing it - perhaps together with Germany and Italy. I understand the argument, but i don't think it could ever work. The army is simply not going to get any more money now, so replacing the AS90 early is just impossible to do. It would in any and every case be a quite expensive exercise in the short term, and the money for doing it is just not available. Even the replacement of the L118, arguably way more urgent, has been pushed to the right from 2022 to 2030, so i really don't see it being possible. - deliver the PZH2000 capabilities in a more easily deployable, more agile platform... which would work with considerable less manpower, too, which is a crucial factor in really achieving savings. Manpower remains the most serious burden on the budget, after all. Does the British Army then have to rely on on their "70km sniper"--the GMLRS for an effective deep strike? Well, absolutely. But that's true of the armies who have the PZH2000, too, as of now: a few kilometers more in useful range does not mean "deep strike". It's a tactical advantage, yes, but nothing more than that. If internet sources serve me right, aren't the range of both NATO and "Eastern" Artillery relatively the same? The Western 155mm and the russian 152mm likely behave similarly, yes. It's the lenght of the barrel that makes the difference, anyway. Now most self-propelled guns use the longer, more effective 52 caliber ones, while the AS90 is still stuck to the shorter one, 39 calibers long. your source? I thought the americans are still still with 39 cal. That's because they also have been having trouble in securing funding to progress their artillery capability. Crusader cancelled, FCS Gun cancelled, Paladin PIM upgrade is all what is left. Or even the towed FH77B05, are the most notable L52 systems. The AS90 itself was due to get the 52 caliber barrel in 2001, as part of a wider upgrade. Sadly, it ended up shelved. M777 is also, as of now, a 39caliber weapon, but that's because it has to be an highly mobile, lightweight weapon. Great Information . Thanks for sharing . If there was the requirement, the will and the money for it, yes, it would be absolutely possible to have a 76 gun aboard, almost certainly on top of the hangar like on the FREMM General Purpose in the Italian Navy, which have the 127 on the bow and the 76 on top of the hangar. thanks for that , i find the various possible options for the type 26 very interesting if not actually stretching into the fantasy fleets realm . You post great articles read them all and refer back constantly.Im currently looking at different secondary armaments for the type 26 and if there is a more effective option . i was thinking of maybe 3 x phalanx . 1 forward as on the first design and 2 on the rear sponsons where the 30 mm look like they are going . any thoughts? 3 Phalanx on a frigate are too many. Too much expense for far too little gain. Two are more than enough. Thanks for a great article. Ive read it twice now for full effect. In fact in so convinced of the shifting paradigm in ship to ship IR \ SAL mode, at a 50 mile range and 25 round per minute sustained fire. i wondering how on earth you defend agains that ? Both are likely to be completely overwhelmed. are we going back to the days of heavy armour and longer ranged guns here ? Seems hard to imagine a return of heavy armour. Probably, instead, a greater focus on tryint to get laser defences to work, as they are the most appropriate, in theory, to face this kind of saturation attacks with small, fast shells incoming. But the guns seem to have interesting times ahead to enjoy. Glad you appreciated this piece. I am glad that I came across this post!! You have done a Wonderful job with it! I rather suspect that these modern developments are being underestimated in their potential importance. NGFS is not just an almost forgotten art form, the mission itself presupposes friendly troops inshore needing artillery support. In fact the strategic value of naval gunfire was largely lost in WW2 analyses partly because of the focus on airpower and partly due to naval gunnery being a largely deterrent, and everyday, effect. Take the RN's raid on Genoa which persuaded Franco not to join the Axis. Or the red zone around the Axis coast ( 30 miles) where armoured forces would not be stationed for fear of coming under a light cruisers guns. The raid on Sebang to put a vital refinery out of action or the innumerable times that patrolling cruisers and destroyers merely emptied their magazines into an enemy harbour on their way back to port. The best platform for these japes was the light cruiser, able to put down 120 tonnes of HE in short order, but only to a range of about 20km. The debate on the other hand has almost entirely been about battleships and 16inch when the most efficient platforms for weight of HE delivered were much smaller calibres and much small vessels. This is easily computed in terms of throw weight per hour. Take a recent operation such as Libya where the airpower bill came to well over a billion quid. Again the debate revolved around how much cheaper a carrier would have been. Given that almost the entire population lives within 20 miles of the coast however how much would the same operation have cost entirely through NGFS and UAVs? Timely weight of accurate fire is a difficult thing to bring about through airpower, given the distances involved the only way is a cab rank of heavily tanked aircraft hence the bill. With the advances in range and accuracy there is no earthly reason why a Type 45 with plenty of sea room couldn't adequately protect several smaller vessels which also had adequate sea room. Also the original AGS was to be vertically launched, as was a proposal to equip the USN SSGNs with 5" mounts which fitted into their unused D5 tubes. The threats against NGFS are always stated to be modern sea skimming ASMs, SSMs and diesel electric subs, though there is no reason why something akin to an AGS couldn't easily fit into an SSK, which is itself the best defence against coastal SSKs and immune to SSMs. Imagine the range on a 16" VULCANO!